It's been a long day here at the Casino Barcelona, but we have finally crowned ourselves a brand new champion. Carter Phillips won three seats for this event online and was already ahead for the trip before he'd even sat down at the EPT Main Event felt after chopping the €1,000 side event. Nevertheless, in spectacular fashion he went on to beat a field including three former EPT Barcelona champions, coming to the final table as chip leader and only losing the lead once before he got heads up with Marc Goodwin. Phillips played some very high-grade poker and fully deserved to win the trophy and the thoroughly enviable €850,000 first prize. 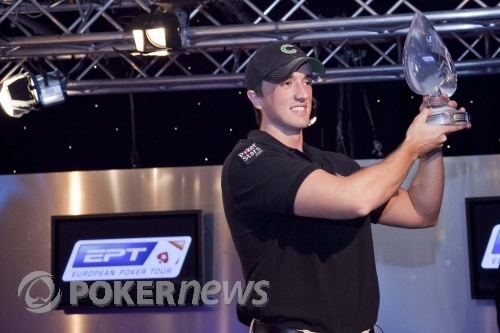 As he was interviewed immediately after knocking out Goodwin in second place, Phillips was on the verge of tears, and why not -- he can't even drink in his home country, but at just 20 years old he's already picked up one of poker's highest accolades, an EPT title. As he prepares to party the night away, from all here at PokerNews.com and the Casino Barcelona, it's thank you and goodnight. Carter Phillips raises to 275,000 and Marc Goodwin calls. 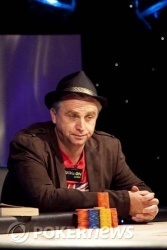 The flop is and Goodwin checks, Phillips fires 310,000 and Goodwin suddenly reraised to 1,160,000. Phillips thought for a while before making the call. 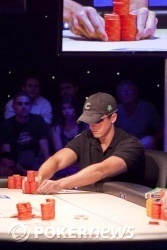 The turn was the and Goodwin moved all-in for around 4 million into about a 3 million pot. Phillips agonised at this shove and visibly looked perplexed. The American took a long time thinking out his options, several minutes in fact, during which he apologised to Goodwin for taking so long during a difficult decision. Finally, Phillips made the call and Goodwin showed for a gutshot and Phillips flipped for top pair. Suddenly Goodwin needed to hit an Ace or a Jack or he was out. 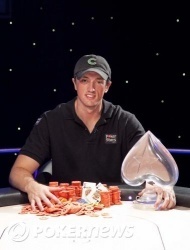 The dealer slowly dealt the river, it was the and Goodwin finished in second place. Last seven or eight hands have all been taken by a button raise. Phillips raised, but this time Goodwin three-bet to 750,000 -- most suspicious behavior. Phillips thought so too, and folded. Goodwin made it 335,000 to go and Phillips made the call: onwards and flopwards. Goodwin continuation-bet 550,000, and Phillips gave it up. How Many Chips Do They Have? ...Because then you'll get to see hilarious videos of Jason Mercier stealing the trophy and then the rest of the heads up.